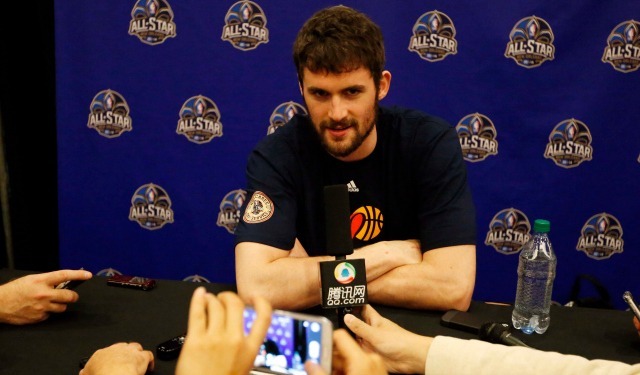 All-Star forward Kevin Love is now a Cleveland Cavalier. LeBron signed to come back, and a few hours later he called me and I said “I’m in.” That had a lot to do with my decision. It means a lot to be a part of this organization. … Everything in my entire life for the last six years had led me up to this opportunity. The deal may have gone down sooner, if not for the caveat of one player – No. 1 overall draft pick Andrew Wiggins. The drama surrounding Wiggins as a key cog for the Love trade was documented earlier this month on World In Sport: while the Cavaliers were hesitant at first to let go of a potential superstar in the former Kansas Jayhawk, they relented for the opportunity to nab Love from Minnesota. It was, to say the least, rather awkward for the 19-year-old in the subsequent weeks before the trade was official. As for Love, he joins a lineup centered around the aforementioned James and fourth-year point guard Kyrie Irving, along with a bevy of specialists and veterans. Essentially, he fills out a team that, since rumors of the trade went down, had long been touted as the favorites to win the Eastern Conference. The trade also officially reunites James and Love, who played together on the 2012 U.S. Olympic Team in London. James had long sang Love’s praises after he contributed heavily to a gold medal run, which was a large motivator for the latter in his decision to play in Cleveland. The only questions, now, involve Kevin Love’s long-term future in Cleveland. After all, the three-time NBA All-Star was entering the final year of his current deal with the Timberwolves – he has a player option of $16.7 million for the 2016-17 season, but all reports indicate he will choose not to pick it up. And, considering the fluid nature of the NBA hierarchy, there is no guarantee that he will sign a long-term deal with Cleveland. Furthermore, despite the eye-popping offensive stats he has put up throughout his seven-year career (19.2 points and 12.2 rebounds per game; 26.1 points and 12.5 rebounds per game in 2012-2013 season), Love has been criticized for his lack of an all-star defensive game. He also has been the primary offensive option in Minnesota for his entire career. Will these facts come back to haunt him, working with LeBron, Kyrie and Co. in Northeast Ohio? Then again, he did say in his press conference that he has no plans of leaving after next season. “I’m committed to this team, committed long-term to the end goal and that’s to win championships,” he said on Tuesday. There is also the fact that, for all intents and purposes, one man brought him to Cleveland – one LeBron James – and, as long as James is in a Cavs uniform, there is no reason to believe Love will not be. As for criticisms on defense – granted, they are fair. Frankly, the Cavaliers’ defensive game, as a whole, has been questioned heading into the 2014-2015 season. Regardless, Cleveland is still the home of what many consider the best player in the game. And, with him, comes a new philosophy in how Cleveland will play as a team. There will likely be growing pains for individual players to start, especially on defense. But, that doesn’t mean the likes of Kevin Love are incapable of learning how to play a more effective defensive game. Ultimately, this will be a fresh start for Kevin Love – a new beginning on which an NBA championship is truly possible. He signified this by choosing to forgo the No. 42, despite Hall of Fame former Cavalier Nate Thurmond giving his blessing on using the retired number. Love will wear the No. 0 with the Cavaliers, as a nod to his home state of Oregon, and as a reminder of the first number he wore as a child. With that, there will be a new “Agent Zero,” residing in the city of Cleveland. Whether he can fulfill the promise of a championship alongside Cleveland’s favorite son remains to be seen. But the prospect of another “Big Three” settling in the state of Ohio is no longer speculation or rumor – it is a bright reality.